Many years ago I was in a sales training class room and learned a simple and remarkable formula that I have never forgotten. I want to pass it along here. Step 1. The instructor told us to write down on a piece of paper the amount of income we absolutely had to have for the year. He was very specific on the issue of this wasn’t what we "wanted" or "desired" but how much did we have to have – no matter what. The irreducible minimum. Step one was for us to figure out what really was our personal bottom line. He said we have to know this number before we can proceed to step two. He gave us about fifteen minutes to figure it out and waited until each of us let him know we had the amount and had it written down on the paper. Step 2. Look at that number. That was it. He announced that we each were going to make that amount of money. Most of us groaned and protested. He said that unless we changed our ideas of how much we really had to have the number on the paper was going to be our income for the year. As you might imagine, it turned out he was right. What allows income to change is the DEMAND FOR INCOME. Not "want". Demand. The same is true for savings or net worth. There is an amount of money that is "right" for you to have. Get much below that number and something must be done about. Now. If the amount on hand rises much above that set point you will see the person obsessively get rid of the "excess" money on hand. The amount that is just right – the correct amount – varies from individual to individual greatly. It has precisely nothing to do with intelligence or I.Q. It has everything to do with the considerations of the person. The most interesting things I have ever learned on this subject were ideas I learned from L. Ron Hubbard. Change a person’s acceptance level and you have just changed the thing that actually matters. People are not impressed (for long anyway) with what they have. If they already have it (and can keep it) they aren’t looking up at it – they are looking down or across. This issue, acceptance level, is the monitoring factor in one’s income, wealth, really their environment in general. Want to know the person’s Havingness Level? Just look. What do they have? You’ve been to someone’s home at some time, wondering how could anyone live like that, in that condition of squalor. That level of squalor is what they can accept. Same thing in the relationship department. We’ve all seen the man or woman who leaves a nice and decent person so they could run off with a tramp. They could not "have" a nice and decent person. What they could have was a tramp. What is fascinating (at least to me) is the realization that the person usually does not wait until he physically receives the thing he can’t easily accept to then waste it (customers, money, relationships). The most common point of waste is prior to receiving it. What I am about to write in this paragraph is so obvious once you see it that it will seem like you’ve always known it. Lets take money as an example. 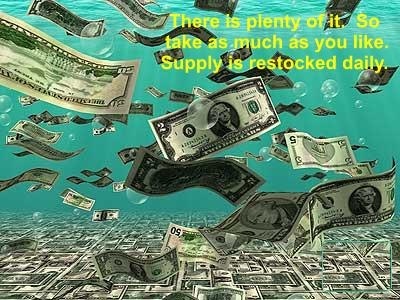 Most of us are currently wasting HUGE amounts of money. That is correct, you are actively wasting a huge amount of money. For example, how much could you make if you really applied yourself? Really. With what you know and what you have at your disposal right now (nothing new to learn, nothing major to buy or acquire to make the change possible) how much could you make right now if you did the things you know you "ought to be doing"? Nothing here I’m telling you to do. You already know this and no part of it is new data or a new insight. So subtract the amount of annual income you currently make (last 12 months) from what you know you could make if you did the things you know you could and should do; isn’t that quite a bit of money? That is the amount you are currently wasting. There are actions you take which are your Dollar Productive Activities. When you are doing those actions you are making money, lots of it. For a Realtor a primary method of wasting income (never receive it) is to spend time (fill the day) working on things that – even when done correctly – do not lead to getting more listings or getting a buyer into escrow. Most agents spend the bulk of their time working on things that don’t even have the charm of deliberate nonsense. Deliberate Nonsense can be a lot of fun. And it has its own very desirable product. I believe that if you are not going to work on something that matters (leads directly to getting and keeping customers) in your business you are better off to goof off. Literally. Know that you are not working and that you are not pretending to yourself to be working. This isn’t "work hard, play hard" – whatever the hell that means. It is DO WHAT YOU ARE DOING WHILE YOU ARE DOING IT. That is also from Hubbard and that is a recipe for success. Do what you are doing while you are doing it and know that you are doing that thing. If you’re not working, don’t work. If you are working, work. None of this is to imply that work – even hard work – can’t be a lot of fun. You can factually change your income by changing your viewpoint of "how much you really have to have". I understand that seems simple. It is. Actually, it is really the only way one ever does change their income. They change their mind about what is "necessary". Then there is the other part: DO WHAT YOU ARE DOING WHILE YOU ARE DOING IT. It is sometimes amazing how it lightens one’s load to find out that you weren’t alone in having a particular problem. The downside of course is if one is seeking agreement on having that problem the people they find in agreement with the problem can become a support group for the problem. And that can equal agreement with being a victim. Not really where I am wanting to go with this thought. I’ve written before that from the time the Phoenix market crashed at the end of August last year until March of this year I had to feed my business a bit over $500,000. I didn’t like it but wasn’t really concerned. My wife and I had dinner Friday night with one of the other most successful agents in Arizona (also a couple) and she confided that they were out of pocket just over $300,000 for the same time period. They work a higher price range than we do (their average sale is 550k, mine is 250k) and they didn’t have to start feeding their business until November. We got hit earlier as our price range was instantly effected by the sub-prime meltdown. Well, we went into the black in April and so did they. Not for the year but for the month of April. Home sales in Phoenix were up April 2008 over April 2007. That is the first time that kind of stat has been true for over a year. When you have a really big operation (read: marketing based) you can get a nice rise from a rising market. You can also get a brutally big bump from a falling market. None of this is to suggest that one’s stats are not caused by themselves. But none of us personally pushes the river. When one’s business is based on prospecting they can turn it around much much faster than if marketing based. Surveys are the key to stats. That is such an important concept that if you were to memorize it and learn to teach it to others it would be a good thing. Surveys are the key to stats. When you are marketing or selling anything – if successful – you are delivering a message or making an offer that the public you are trying to reach will respond to. If you are offering the "wrong" thing (they don’t think it is valuable) your efforts won’t be successful. If what you are offering is what they want – success. For example, I am currently promoting "we can sell your home even when others are giving up". In today’s market that is an acceptable message. If I were to have run an ad like that three years ago it would have been absurd. Most cab drivers could have sold a home in the market we had three years ago. So when the phone stops ringing it isn’t that "marketing no longer works", it is the "button" or offer being made isn’t current any longer. When you are talking to someone it is almost instantly obvious if what you are saying "doesn’t survey well with them". You can change your message on the spot. All agents successfully listing and selling homes are quite skilled at doing these "surveys". They just have never thought of what they were doing as gathering survey data. It is faster and easier to change your message if your communication is mostly live. Finding the correct buttons for a marketing campaign takes much longer, not to mention the ad production time. Agents all across the country have taken a beating this last year. And many of them have felt like they were in the wilderness all alone. Most agents don’t have accurate data on what other agents and companies are doing. As most real estate agents tend to present themselves as "I’m really really really successful" – even when they are not – there can sometimes be a very false picture. The agent knows they aren’t doing very well (compared to how they were doing) but doesn’t have that same subjective reality on how the other fellow is doing. I am surprised when I answer someone about my stats and they experience relief that "I was honest". They had been talking to agents who were telling them, "I’m doing great". We all like to think of ourselves as buzzing along like the green line on the graph up top. Truth is almost all of us – when highly successful – have stat graphs that look much more like the red line. 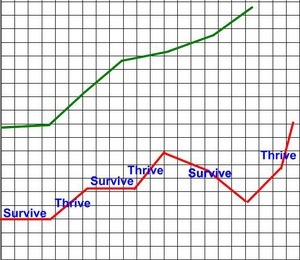 Periods of survive, followed by periods of thrive. We make the bulk of our money during the thrive periods, when the stats are moving up. The goal isn’t to have a great year. The goal is to have a great career. If you think traditional Realtors have had it rough imagine what it is like for the discount real estate companies. In my area, with my stats way down (a little over 75 million production in the past 12 months) my group outsells all of the Help U Sell offices here combined. They have 14 offices (that someone is paying rent on) showing in our MLS and my group does more business than all 14 of them combined – and this is a national company. The small discount companies aren’t even doing that well. Lower commissions aren’t the "thing" now. Results. Can you sell my house? Do what you have to do, learn what you need to learn to be able to convince a seller to price their house correctly, so you can answer that question, "YES", and you too will see that your very best years are yet ahead of you, not behind you. Survive until you can thrive. I received the following email from Justin. 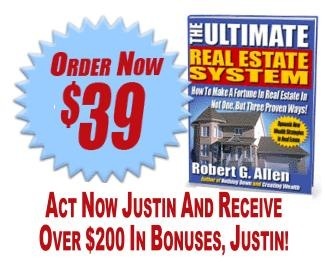 I have read The Millionaire Real Estate Agent it is fantastic. I also have the Billionaire Real Estate Agent. 2. A system that once we get the leads, how they are handled. 4. A system to sell our own listings. We are currently getting 50 to 75 buyer leads each month but once the lead comes in the difficulty is in tracking the lead and making sure that our buyer specialist are doing everything they are supposed to do. We are also getting ready to do a huge marketing campaign to get seller leads but I don’t want the same problem to happen that is currently happening with the buyer leads. 99.9% of Realtors have a Real Estate job, you my friend have a Real Estate Business. The proof is that while you were away from your business taking care of health issues your business grew. Not a small feat. The other 99.9% of Realtors would have gone Bankrupt. That is what I desire. My goal is to pretend that I am going to Franchise my business and design it so anyone could come in and run it. I am reminded of a mandatory Monday morning sales meeting I attended when I was a failing life insurance salesman in 1969. I was with New York Life and a successful veteran agent from Flagstaff had driven down to Phoenix to talk to us. He was there to inspire us and to help us do better. He was a nice and honest man. After hearing him speak I determined he was also a stupid man. Nice, honest, successful and stupid. Every single person sitting in that room was someone who had no idea where their next sale was going to come from – if indeed there would even be a next sale. He was really happy when he told us that all he did to get business was call his past clients. He had been with New York Life for just under 20 years (all of us were less than 6 months in the business) and he had many past clients. He would have his assistant lay 5 cards on his desk each morning before he came in – each card contained the names and contact information for one of his past clients. He would call each of them and just chat with them for a while. As he was about to hang up he would ask them which of their friends or family might benefit from talking with him. He had enough clients that calling 5 of them 5 days a week for all the weeks he worked that he would wind up calling each of them about once a year. This was his system, and it worked beautifully. Naturally, I was relieved to know that in a short twenty years I wouldn’t have to worry about money anymore, I could just call my past clients. At the time I could have called all of my past clients at the burn rate of 5 a day in less than a week. I didn’t have an assistant, nor could I even afford an office for one to sit in but I could sure see the beauty of his system. Only it had nothing to do with me. Or anyone else in that room. At the time none of us could use it. In my business now we have lots of systems. I am totally willing to share any or all of them with anybody who wants them. You can have any of my checklists (you can download some of them here), you can copy them, modify them – in short, use them any way you like. The first thing you will be aware of is my checklists are my checklists. You will need to make some changes in order for them to be useful for you. All of your checklists – if they are truly going to matter – will need to be composed by you. You can find lots of stuff lots of places but for it to matter, you and what you are doing need to be a part of it. Why bother with a checklist? Can a checklist be a system? Sure. All of our checklists are lists (usually in the correct sequence) of those things that must be done to get the exact product that particular action is supposed to produce. In most cases the checklist represents what I used to do and now someone else does it for me. It is a hat I wore and now someone else is going to "wear that hat" and take care of it for me. I have a "hat" for how a listing presentation is to be done. (you can see all of that here) All of my listers wear the hat the same way. Always giving their communication, always them injected into the cycle – it’s theirs now. But how that "hat is worn" makes all the difference in the world. There is a proper sequence and attitude for a listing presentation. It does not vary. My newest lister has been with me about 3 years. My most senior lister has been with me over 12 years. I still check with each of them – having them recite the proper sequence at least every six months. How did I arrive at that exact sequence? Did I discover it at Starpower? Yes and no. I got a lot of ideas a lot of places. I tried a lot of things. Most of them did not work. A few did. Out of the thousands of things I tried a few worked. I remembered those. I remembered how I did them. What I said. How I said it. What order I said them in. What order I did them in. I would vary them to see if it made a difference. It did. I then reverted to the "way that worked". Please understand that there is no statement here that what I do is the "best" way. The "only" way or any other thought that would suggest that there are not other methods or approaches that are valid. What I know – from very long experience is that the "hat write up" I have for how to do a listing presentation does work. So you would note your successful actions on all of the things you do. What were the steps? This isn’t just to train others, it is so you can do it again and get the result you intended. What is the correct technology that you used? In order for any of this to matter you have to personally have a subjective reality on it. It has to be real to you. Not a bunch of words on a page but something you can see and know is true. Lets start with "leads". I don’t believe that you are getting 50 – 75 leads a month. I don’t mean to imply that you are trying to con me but if you were getting 50 – 75 leads a month you would be selling 5 – 10 houses a month from those "leads". People in the lead selling business have redefined the word "lead". What most of them sell is an inquiry. Big difference. A lead is someone you are going to call back. You have spoken to them and assessed the quality of the prospect and decided that this is someone who is interested in what you have to offer and is capable of buying a house. You aren’t tracking them because most of them don’t really matter. You are most likely pretty damn good at lead conversion and identifying who is and who isn’t a prospect now. All of the now prospects you sell to or list. The rest of the inquiries sort of get lost. Should you have a system for following up on those? Sure. Outlook, ACT, Agent Office, REST, there are loads of potential systems around. But for keeping track of names, etc., you don’t need to "develop a system", you would need to decide on one and use it. You take anything you do – that you will want to do again (and again) – and systematize it. What were the steps? What was the sequence. When you start doing this you will tend to leave out important steps. Easy to see if you type them up and have someone else attempt to do it without any explanation that isn’t on the checklist. In my office we have every significant (we will want or need to do it again) action "written up". We have a checklist for that action. The first actions to write up are the ones you do screamingly well. Best to write them up when you are in the zone. When you are just flying on that particular subject – write it all down. Write it all down. Write it all down. You will be amazed at how handy that write up will be when you alter your own successful action and, changing something, watch the stat crash. The fix? Simple when you have written up your hat when you were in "Power". Just go back to doing it the way you were doing it when the stat was soaring. Doing this also tends to involve realizing what crashes stats. This collection of what works and what doesn’t work becomes the "policy" of a successful organization. It makes no difference if that organization consists of several thousand people or a person just getting started at something. When something crashes the stat, note it. Make a record of it. When something makes a stat go up, note it. Before long you know with certainty what works and what doesn’t. For example, have you made a record of what you do – that is already working – on lead conversion? This business is simple. Leads. Listings. Leverage. Inquiries are not leads. Some of them can become leads. Some leads can be converted into buyers and sellers. 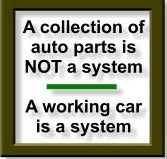 Once you have discovered with certainty what your successful actions are you have your "systems". The discovery process can be a lot of fun. What do you feel are the best 2 or 3 systems to get listings? Good to hear about your new association with AgentGenius. We all need your stuff. Other than Radio/TV, what do you feel are the best 2 or 3 systems to get listings? Other than marketing my listings, what is the next most effective method of attracting buyers? Good news, it is a short list. There are precisely two ways to get business: marketing or prospecting. All methods of getting business fall into one of those two categories. If the question on how to get business includes, "We can’t afford….." then for now skip the marketing part. Prospecting is your answer. Prospect for listings. Buyers are almost never "looking for an agent", they are looking for a house. So, prospect for listings. Emulate top agents. Almost all long-term top agents are listers. To get a closed escrow you must first have an open escrow. To get an open escrow you’ll need a listing. To get a salable listing you will have to have gone on several listing appointments. To get a listing appointment you will have to have leads. Therefore, you are in the lead generation business. Full time. If you are going to succeed that is the business you are in all the time. You are not in any other business. Just getting leads. Get enough leads and you don’t really have "unsolvable problems" in your business. Don’t get enough leads and all you have are "unsolvable problems". Your main dollar productive activity is getting leads. Time spent working on getting leads is time well spent. Invested, if you will. Time spent on most other stuff is quite possibly wasted time. There can be a real charm to deliberate nonsense. It can raise a person’s tone and get them out of a bad mood – it can do a lot of good things, it can change lives for the better. Laughing, joking, having fun, creating and spreading a "spirit of play" can be one of the most joyous experiences in life. Do it often. But if not knowingly and causatively "playing" please don’t pretend that the mindless time wasting activities that most real estate agents spend their days working on are productive. Are you causatively playing? Cool. Otherwise, if you don’t physically have a buyer to show a house to or are in the process of physically writing a contract, or on your way to see someone to do just that or to take a listing – prospect. Get leads. Get more leads. The number of leads that you actually need is far far more than you even think it is – you need more than that. Lots more. Work on that. I found the following here: You don’t need a life plan. You don’t need motivation, self-confidence, peer support or even luck. All you need is the willingness to take the next most obvious step—then repeat the process again and again, regardless of how you feel. Try it. Happiness comes from seeing the results of your efforts. You don’t need it before you start. In response to your question, "Other than marketing my listings, what is the next most effective method of attracting buyers?" My answer? Market someone else’s listings. This is what is done with an IDX search. If you want more to market via the various listing propagation sites, borrow them. Ask other agents if you can advertise their listings. Buyers are looking for houses. Get lots of houses on those various sites. Hundreds is the correct order of magnitude. Something I am just delighted to be able to announce is that the Realtor Success Series is finally compiled and there for anyone to see and use. Even I personally had no idea I already had that much content available. I hope you like it. More to come. The Realtor Success Series Page is finally UP! This is something I have wanted to have for a couple of years. Finally it is something that is "done". Done is a relative word, as I will continue to add news posts to that page. But at long last, all of the relevant posts and relevant audio and video (relevant to getting and getting rid of listings) is all accessible on ONE page. It took me several hours of pecking around to find them all (as I knew it would) but now anybody landing here can have full access to that material. I won’t be surprised if I wind up sending more traffic to Bloodhound having left than I did while I was an active contributor there. This is my first "official" post on this blog. Welcome! You are currently browsing the Number 1 Home Agent blog archives for May, 2008.